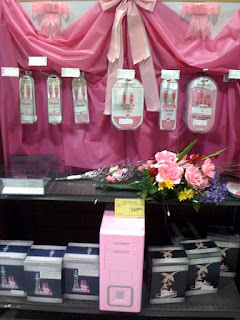 A timely find, we saw this at Fry's this morning - a computer towers and cables for the ladies! Defying Fry's NO CAMERAS policy, I snagged a quick shot of the tacky display. Oh, and the USB, power and data cables aren't just pink, they're also oh-so-cutely adorned with crappy and tacky plastic crystal jewels.